Ultrasonic Array Controller UAC128 is a multi-channel, continuous-wave array controller used for driving ultrasonic transducer arrays for research and applications, such as ultrasonic particle manipulation, ultrasonic haptic feedback and wireless power transfer. Vilnius, Lithuania – October 17, 2018 – The Ultrasound Research Group (URG) at Neurotechnology today announced the launch of its new Ultrasonic Array Controller UAC128, a continuous-wave FPGA-based controller for driving ultrasonic transducer arrays. 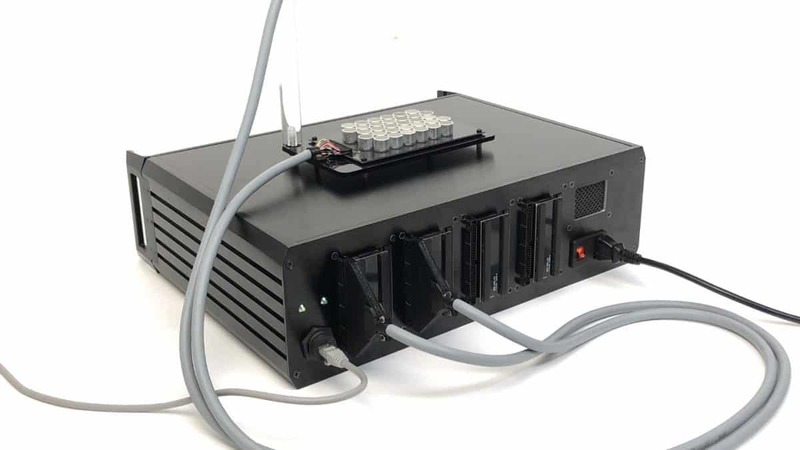 The controller, together with a transducer array, can be used for ultrasonic field focusing, beam forming and other ultrasonic field control for ultrasonic particle manipulation research and applications such as cell trapping, patterning and sorting, patterning and assembly of micro components and materials. The controller can also be applied in ultrasonic haptic feedback and ultrasonic wireless power transfer systems. 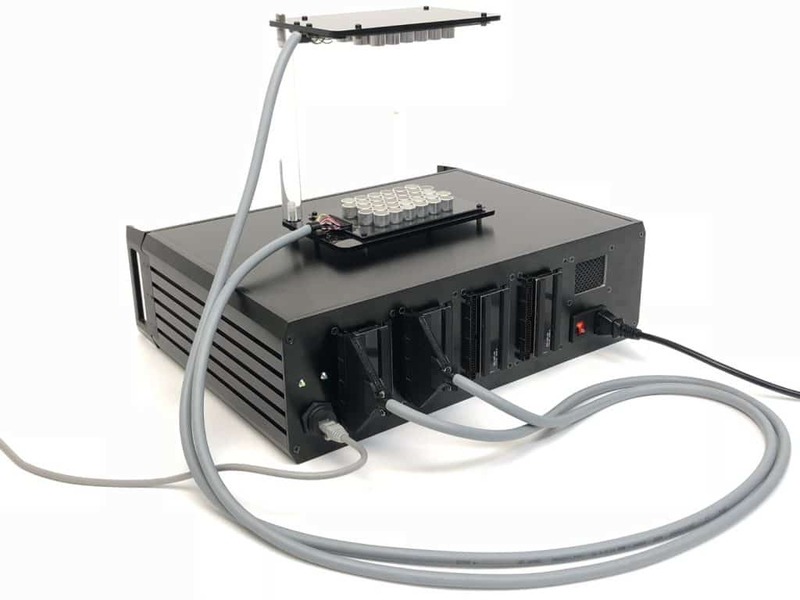 The URG has also released Levitator Model D, an ultrasonic levitator/manipulator that can be driven with the Ultrasonic Array Controller UAC128 and used for demonstration and visualization of ultrasonic particle manipulation. Levitator Model D is most suited for levitation and manipulation of expanded polystyrene (EPS) particles, however levitation of heavier particles, such as water droplets, is also possible. Both the Ultrasonic Array Controller UAC128 and Levitator Model D are available now from Neurotechnology’s URG. The URG can also custom design and build levitators/manipulators to meet a range of specific applications. Contact the URG. Neurotechnology is a developer of high-precision algorithms and software based on deep neural networks and other AI-related technologies. The company was started in 1990 in Vilnius, Lithuania, with the key idea of using neural networks for various applications, such as biometric person identification, computer vision, robotics, and artificial intelligence. Since the first release of its fingerprint identification system in 1991, the company has delivered more than 200 products and version upgrades. More than 3,000 system integrators, security companies and hardware providers in over 140 countries integrate Neurotechnology’s algorithms into their products. The company’s algorithms have achieved top results in independent technology evaluations, including NIST MINEX and IREX. To meet the demands of a variety of applications, Neurotechnology has developed many advanced algorithms based on deep learning and computer vision as well. The company’s Ultrasound Research Group (URG) also undertakes research in the fields of ultrasonic particle manipulation, parametric array and transducer technology and develops novel algorithms, hardware and electronics solutions for ultrasonic applications. © 2018 - 2019 Neurotechnology. All Rights Reserved.